The Ukrainian parliament speaker said that the country's government should be "reset" in the event of failure to find a way out of the political crisis. KIEV (Sputnik) – If an end to the Ukrainian political crisis is not found, then the Cabinet of Ministers and perhaps the entire Parliament should be “completely reset,” Verkhovna Rada speaker Volodymyr Groisman said Wednesday. “Either a model to end the situation is found this week here in the Parliament with political forces, or this government should be completely reset, and if necessary, this Parliament as well. There simply can’t be any other way,” Groisman said during the opening of the Verkhovna Rada session. The Ukrainian government has been in turmoil since early February when the country’s reform-minded economic development minister resigned citing the slow pace of change and widespread government corruption. Five other ministers initially followed his lead but later rowed back on their intention to quit. On Monday, the faction in parliament aligned to Ukrainian President Petro Poroshenko – the Petro Poroshenko Bloc – said it had assessed the Cabinet’s work in 2015 as "unsatisfactory." 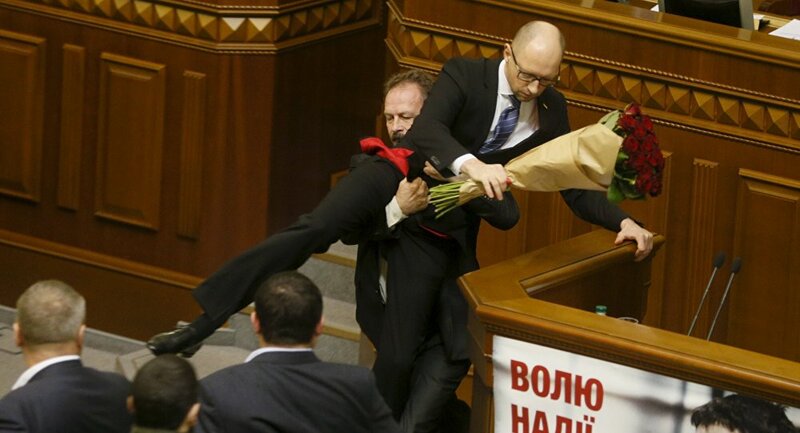 On Tuesday, the government of Prime Minister Arseniy Yatsenyuk survived a vote of no confidence in parliament despite the rapid decline in Yatsenyuk’s popularity in the country and Poroshenko’s explicit demand that he step down.